Applying Mehendi is a beautiful and ancient tradition in India. 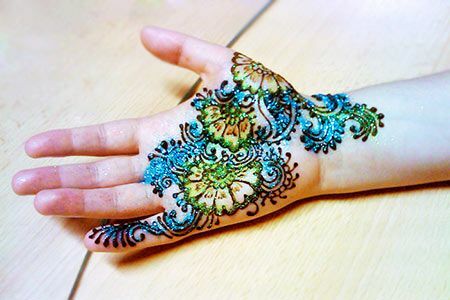 Adorning the hands with beautiful mehendi has been a craze among ladies from every age group since time immemorial. 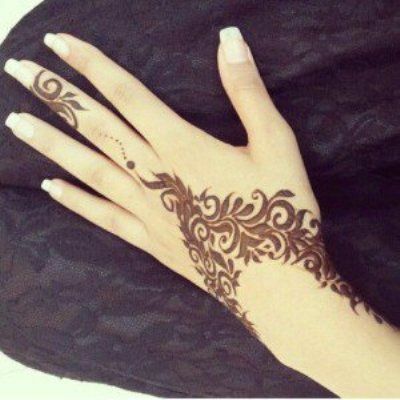 Every girl would swear by mehendi to enhance her ethnic beauty. It is an ornament for hands, wrist and feet without which any festivity seems incomplete. 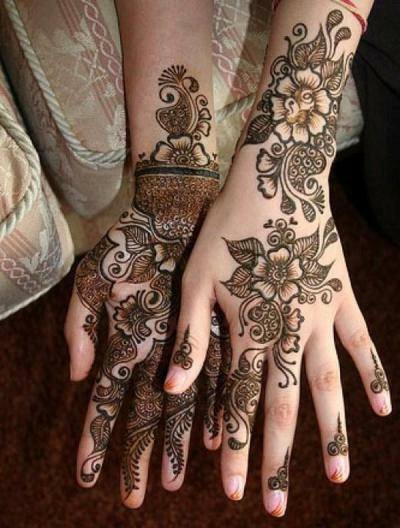 We all know how ladies love to revel in the enchanting fragrance and bold designs of mehendi. 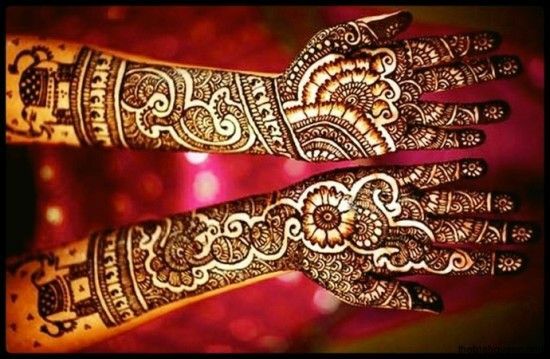 So, all the lovely ladies out there here are some beautiful mehendi designs for your hands to make any occasion special. 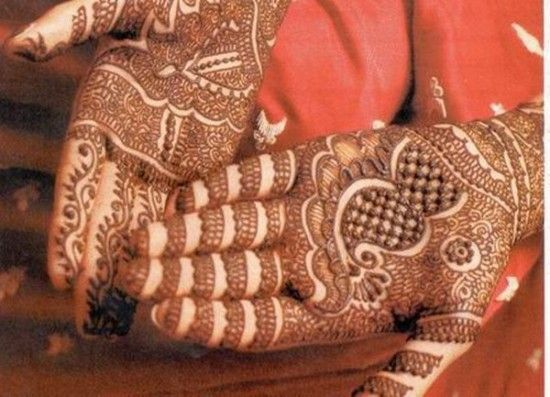 Mehendi in itself is a tradition, and hence there are numerous mehendi patterns that reflect tradition. 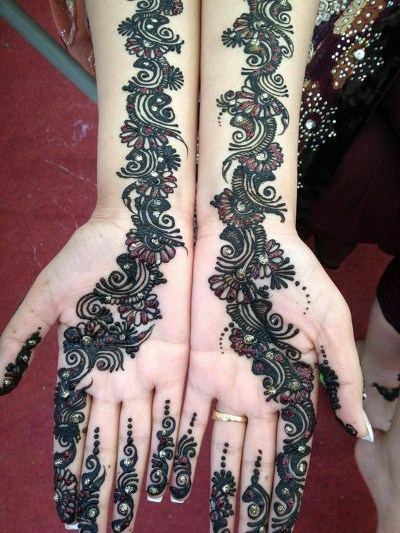 Intricate motifs, floral designs cover the hands and arm beautifully leaving no space in between. These are the first choice of any mehendi loving women for every occasion. These days’ simple bracelet mehendi designs are the talk of the town. Though simple they look extremely elegant on any occasion. Even the mehendi shy girls would fall in love with a bracelet mehendi. 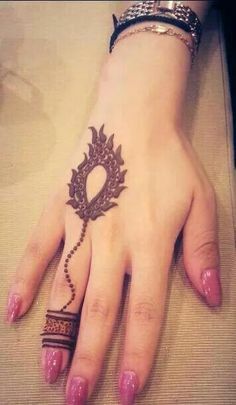 Why not add a ring to your bracelet mehendi design. A kara or bracelet on the wrist and ring while keeping the palm plain takes away the gaudy look mehendi is known for but definitely looks classy and elegant. The best part is you can try it at home yourself. Who needs bangles when you can paint them in beautiful floral or netted designs on your wrist with mehendi? Extremely beautiful swirls and curls wound around the wrist give the appearance of bangles. Fraught with intricate details and elaborate patterns bangle mehendi can be the center of everybody’s attraction. For those who love ink but are way too afraid of the pain that comes along can get a temporary tattoo with mehendi. 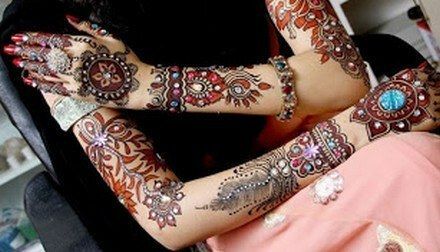 You can also flaunt your backless and sleeveless dresses on a special occasion with a henna tattoo and make all the heads turn. One of the many good things about a tattoo mehendi is you don’t need any occasion to get it. With or without occasion it helps add flavor to your personality. 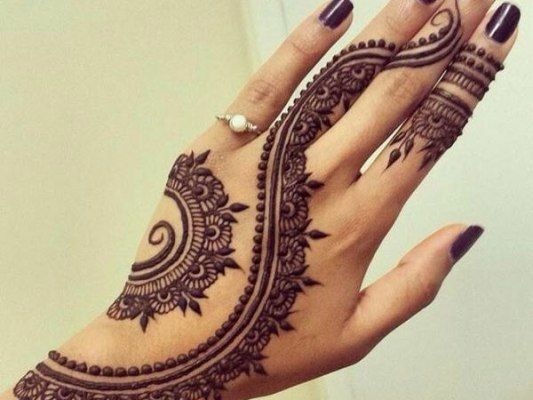 There are various tattoo mehendi designs which are simple, less detailed yet jaw dropping. 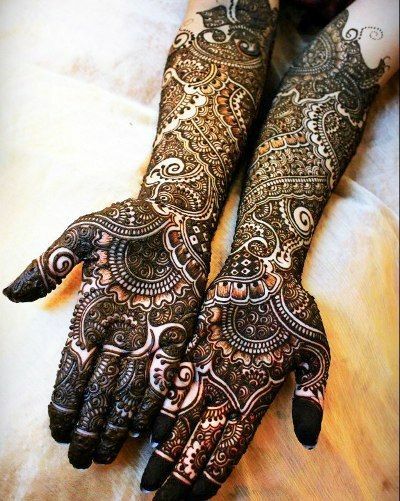 If you love heavy intricately woven motifs, Indian mehendi designs are known for them. The unique designs fill up the entire hands with floral patterns, peacocks, lace that are bold and prominent. Indian mehendi looks glamorous on any and every occasion. Since the art of mehendi can be traced back in history there are many old and elementary designs one can experiment with at home. 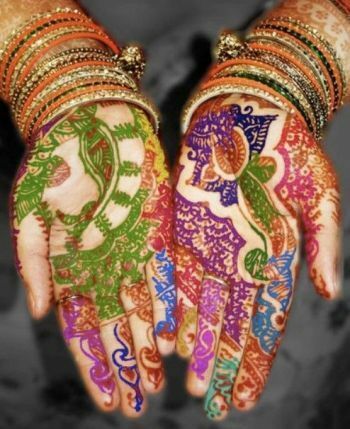 A bright sun like circle in the center of the palm and top of the fingers covered with mehendi is an old pattern. You can create a unique blend of old designs with the new ones and shine out at the parties. Floral patterns and peacock motifs are contemporary designs. A combination of the two with small little flowers and intricately woven designs on the fingers is an unorthodox style that is different and extraordinary. 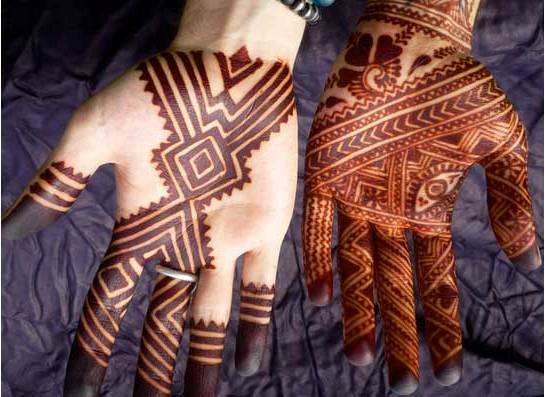 Pakistani mehendi is a fusion of Indian and Arabic designs. 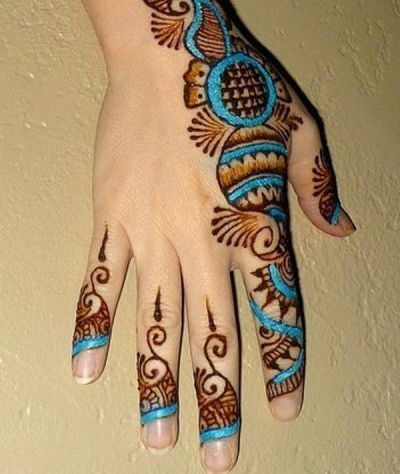 Beautiful swirls and curls with elaborate motifs on the palm and back of the hand imparts it a unique touch. Intricate flowers and leafy motifs are the highlights of Pakistani mehendi. 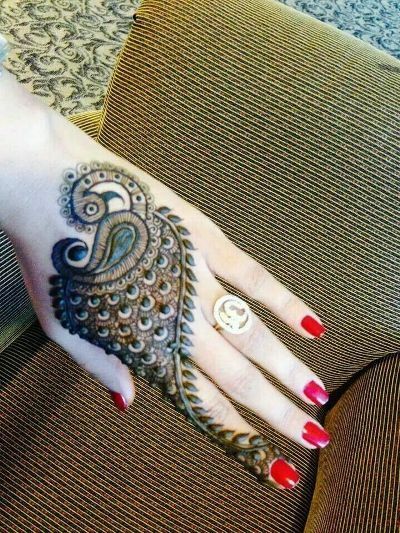 Traditional ornaments enhance a beautiful mehendi design. 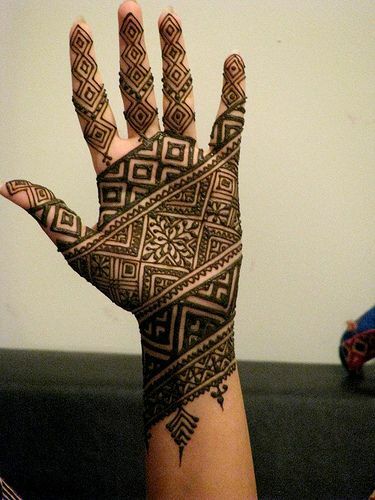 Black mehendi is the latest craze among the young mehendi lovers. A leafy or floral pattern outlined with black mehendi and filled with red looks gorgeous and compliments every festive outfit with its sheer beauty. A clutter free mehendi with bold outlines alone also look really chic and trendy. 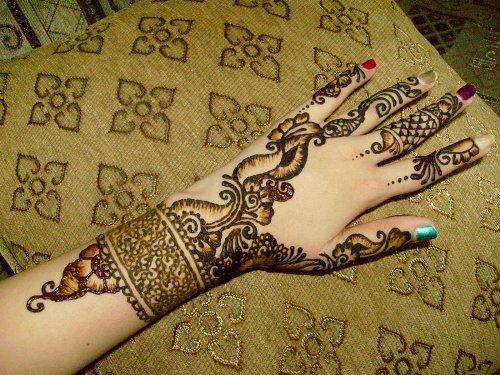 If you are bored with the same floral and leafy patterns, Moroccan mehendi is the best option. 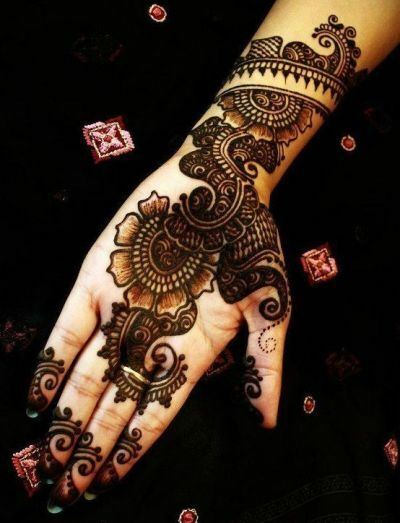 Unlike the usual floral motifs, a Moroccan mehendi design is more about geometric lines and tribal figures. 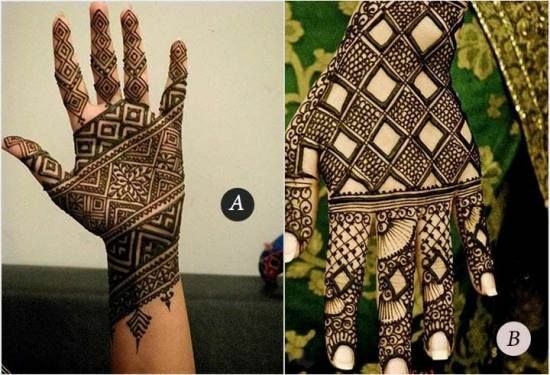 Straight lines cutting at right angles, triangles, diamonds, chevrons, and other specific layouts, are the signature patterns of the Moroccan style mehendi. These patterns are trend setting as they look extraordinary with any indo-western outfit. 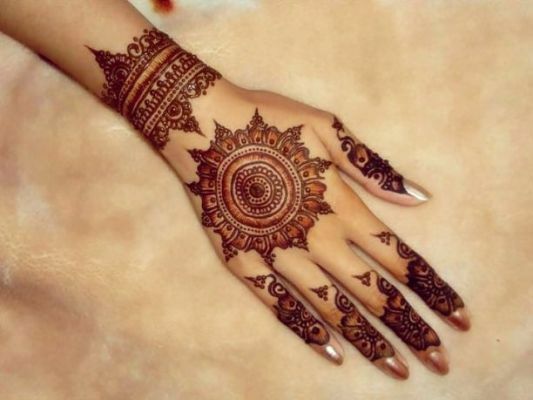 Arabic mehendi is an ideal choice for a modern and sassy look. With distinctive floral designs and intricate motifs, Arabic mehendi designs are both bold and beautiful. 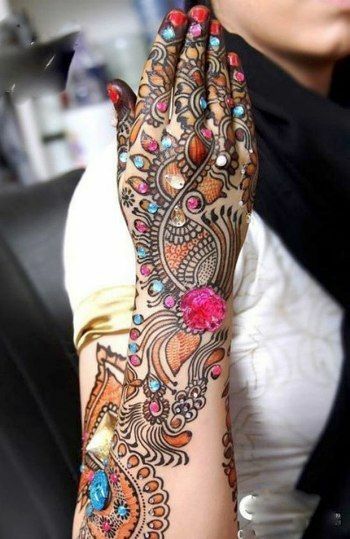 Those who shy away from full hand mehendi love Arabic mehendi designs with a simple and elegant trail of floral motifs running from the top of a finger down to the end of the palm. Fusion of Indian and Arabic designs gives birth to another mind blowing art. 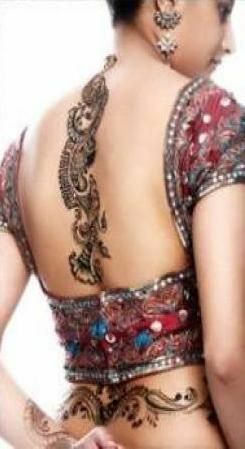 Indo-Arabic mehendi designs are a nice blend of intricate Indian designs and bold Arabic style outline. This has now become the most sought after mehendi design for every occasion. Unlike heavy and detailed motifs and miniature patterns that were in trend some time ago, these days clutter-free and less complicated designs are setting the trend. Modern designs with graceful arches and curves look versatile and go with modern as well as contemporary outfits. 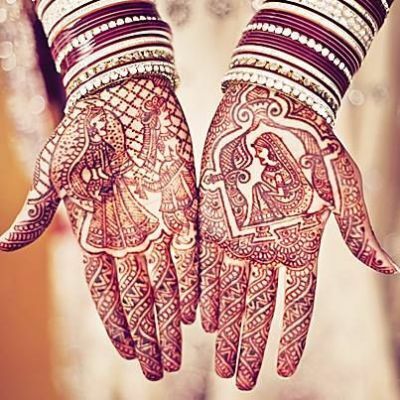 Bridal mehendi brings the oomph factor to the beauty of the bride at Indian weddings, covered till elbow both at the front and back of the hand with detailed motifs, bridal mehendi is classic. Not only hands even legs are adorned with beautiful mehendi designs. 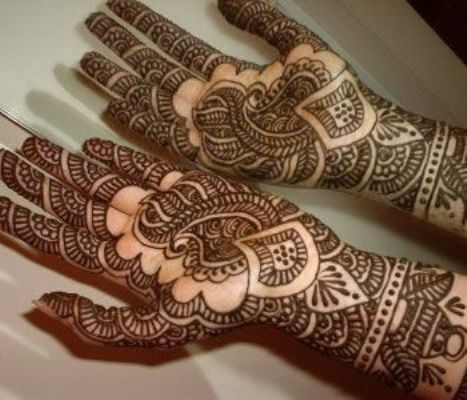 Thematic mehendi designs are done according to the occasion. 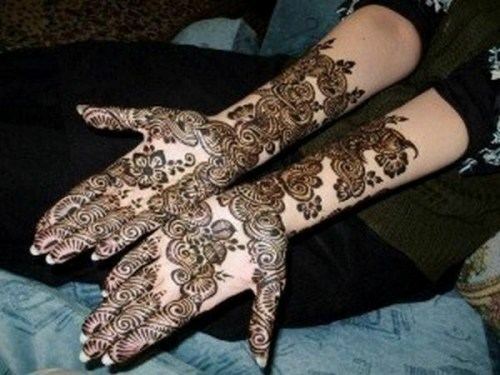 Especially for Indian brides who wear mehendi both on hands and feet thematic mehendi designs should be the first option. These designs feature a bride and groom’s face in each hand, elephants and other symbols that are apt for a bride on her wedding. Just like the royal mughals, mughal mehendi designs are also rich and classy. These designs have a flavor of traditions and are really charming and beautiful. Mughal mehendi designs are timeless classics which resemble the rich art and culture of the Mughals. 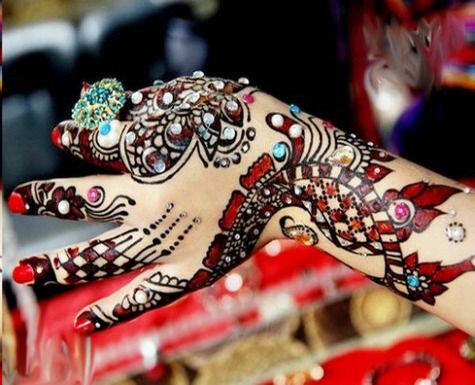 The newest trend in the art of mehendi is accessorizing it. Glitter and beads are used for this purpose. It definitely makes the design look gaudy but in a good way. Accessorized mehendi is definitely gorgeous and eye-catching and looks great on special occasions like weddings. Glitter mehendi is a new addition to this age old practice of wearing mehendi which is becoming popular very fast. A glitter mehendi prettifies any mehendi design and the outfit you wear. Colored glitters and sparkly shimmer in your mehendi will help you dazzle on every special occasion. Beads and stones set beautifully inside the intricate motifs of mehendi have now become the new ornaments for any occasion. 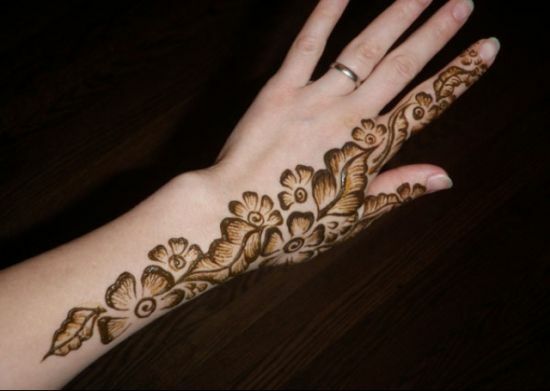 They help highlight the beautiful curls and swirls of a mehendi design and look stunning with party outfits. Glitter, beads or stones all these embellishments in your mehendi design will help you dazzle at all your special occasions. 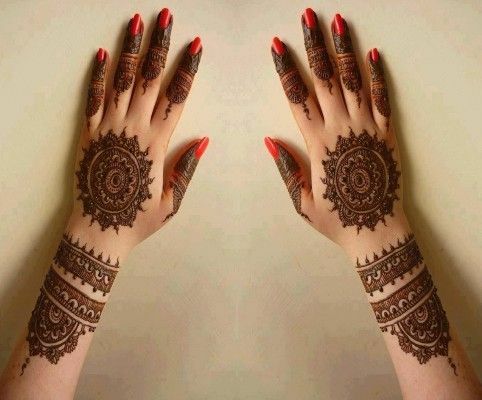 It can be a good change from the usual plain mehendi you have been wearing on all occasions. 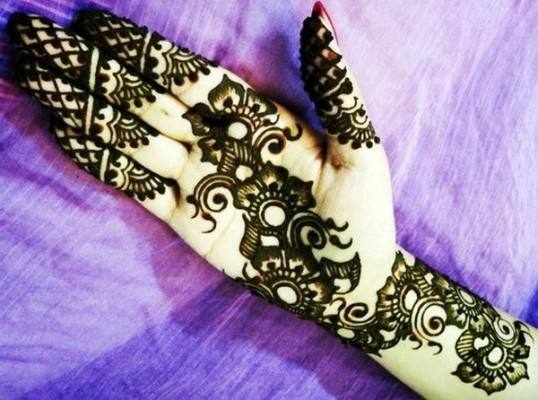 We are mostly acquainted with the red, brown and black mehendi but that’s not it. 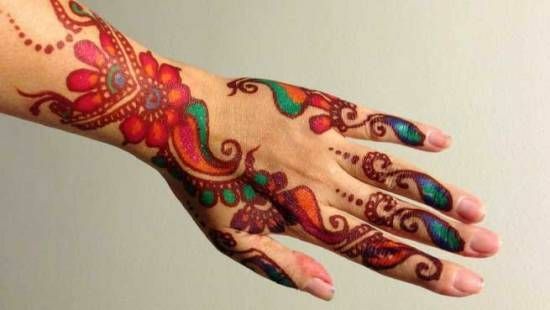 These days multi-colored mehendi is setting the trend. You can choose from different colors according to your outfit and fill your mehendi design to look stunning and shine out. 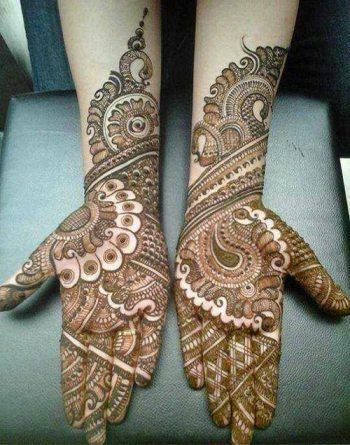 Do not ever get modern Mehendi it is stupid and not traditional. The whole point is to make it nice and traditional for awesome people. Please don’t be an idiot THANK YOU! Nice designs tho!